Veterans qualify for Social Security in the same way as civilians. 2. Can a Marine Reserve Qualify for Retirement Benefits? 3. Can Veterans With 2 Years Active Duty Receive Additional Social Security Benefits? The Social Security Administration runs retirement and disability insurance programs for workers, including military veterans, who have paid into the system through payroll taxes. 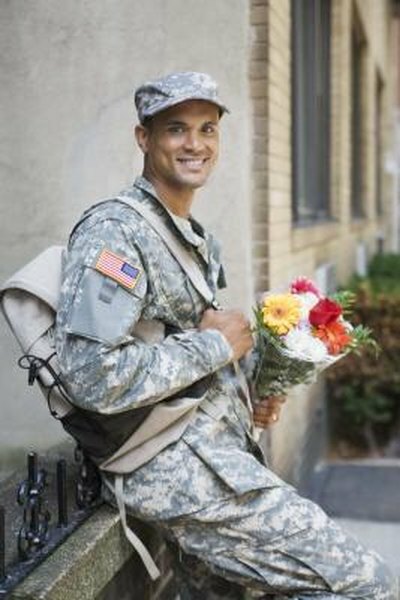 Eligibility requirements are basically the same for veterans as for civilians, but Social Security offers some unique program features for the military. Members of the armed forces contribute payroll taxes to Social Security, just as civilian workers do. The tax rate is the same and military personnel earn "work credits" for the same amount of earned income, up to four credits a year. Although deployment to certain active zones earns an exemption from income taxes, Social Security and Medicare taxes are still withheld. A veteran qualifies for Social Security retirement by accumulating at least 40 work credits over his working lifetime, either from military or civilian work. All the other rules on early retirement, survivors benefits and the disability program are the same. If you served on active duty between 1978 and 2001, Social Security adds supplemental amounts to your earnings record. For every $300 in monthly base pay, Social Security adds $100 a month, up to $1,200 a year. The additional earnings credited to your record means that your benefit amount may be higher when you apply for retirement or disability benefits. If you served between 1957 and 1977, then Social Security credits an additional $300 for each quarter of active duty. Veterans who served between 1940 and 1956 did not pay Social Security taxes. However, the agency credits $160 a month in earnings for military service during that period. There are some conditions: you had to be honorably discharged after at least 90 days of service, released due to an injury or you must be still on active duty. Anyone applying for survivors benefits may also draw the credited earnings on the veteran's record, as long as the veteran died while on active duty. A military veteran may qualify for Veterans Administration disability benefits as well as Social Security disability. The application process is separate, and Social Security reviews the application with the same procedures it applies to civilians. The agency offers expedited processing for veterans who were disabled while on active duty on or after October 1, 2001. Social Security will pay disability even if a beneficiary remains on active duty, under certain conditions, but otherwise applies the civilian rules if a veteran returns to work or begins earning the "substantial gainful activity" amount. Can My Non-citizen Wife Receive Social Security Benefits After I Die?